Will Alonso be looking up at Schumacher at season's end? Formula One world champion Fernando Alonso believes Michael Schumacher's win in San Marino proves the German is once again a genuine title contender. Seven-time champion Schumacher has cut the gap on Alonso to 15 points and Alonso fears he is back to his best. "Michael will be a contender and a big rival at the end of the championship," said the Spanish Renault driver. Schumacher's win in Imola, seen as Ferrari's home track, was his first meaningful race victory since his title-winning 2004 season. The German did win the US Grand Prix last season but only six cars took part in that after the teams failed to resolve a safety row over Michelin tyres. Schumacher showed he has not lost his edge after holding off a battling Alonso in San Marino and believes Ferrari now have a car capable of challenging Renault after a sluggish start to the season. The 36-year-old said: "The championship had not really gone away even with two difficult races. "We should be pretty good from now on. It's getting very close between the top teams." However, Alonso remains confident that it is his Renault team that have the speed and endurance to come out on top. "We were still the fastest car on the track," he said. 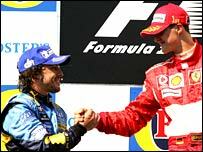 Despite his inability to overtake Schumacher, Alonso will have been buoyed by the superiority of his Renault during the race. The Spaniard's team were expecting Ferrari to dominate at Imola, a track where the Italian team and their tyre supplier Bridgestone traditionally have an advantage. Alonso also expects opposition from McLaren and his own team-mate Giancarlo Fisichella, but he did not mention Jenson Button's Honda team, which has endured a difficult start to the season. "Both McLarens will be there and I hope Fisichella will be there at the end fighting. It can be more than two or three drivers at the end of the championship," Alonso said. "Imola is a quite different circuit (from most of them) so we will find out in the next two or three races which are the quick cars in 2006."